I intend these questions and your responses land in peoples' listening like cave paintings. I intend people are fascinated by them, agog with wonder and interest. When I say I intend people are fascinated "by them", I'm not saying "by them" as "because of" them. I'm saying "by them" as "in proximity to" them. I intend people bring with them their already fascination and their already agog with wonder and interest to these questions and your responses. I ask these questions. That's not the interesting part. You respond. Yes that's very interesting. But what's really interesting is the space, is the context, is the new realm of possibility your responses, as they ripple through the oceans of peoples' listening, make available. 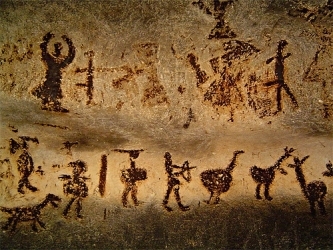 The intriguing thing about cave paintings is we really know very little about who created them. They're here. We discover them. And then our curiosity starts to unfold, riveted by their history and by their timelessness, as well as by what their creator was seeing when he or she painted them on the rock in the first place. Coming up with these 10 questions ie coming up with 10 questions I deem worthy of asking you, is actually less like painting on the rock and more like scratching a sculpture out of the rock using nothing but my fingernails. It took me more than three days to come up with these 10 questions, during which time I also discarded another 1000 or so because they didn't meet my standards for what I, asking you, would want to leave in plain sight for the next 10000 years. Please answer as many of these 10 questions as you like, and ignore those which don't work for you. Having been through the process of coming up with these 10 questions and having now asked them, I'm complete and satisfied. It's enough for me to have come this far with you. It's totally OK with me if you don't answer any of them at all if none of them work for you - in which case I'll keep asking more questions until I come up with ones which do work for you. 1) I know who you are - viscerally, instinctively, experientially. I can also say who you are. And if I did, I'd probably come close to saying who you really are. Yet no matter how close I come, it would be me languaging who you are, not you. Please say who you really are - in your own words. 2) In many of the situations I've experienced when there's work to do within large groups, there's almost always one central figure who does all the talking while everyone else listens. I've come away from such group work acknowledging the central figure for being a great person. In contrast, when people work with you in large groups, you do speak, to be sure, and the group listens, to be sure. But there's always the opportunity for everyone in the group to speak as well - in addition to you. From this opportunity I assert comes the enormous power of your work. In contrast to other group work when I've come away acknowledging the central figure for being a great person, when I participate in group work which you lead, I come away acknowledging you for being a great person, and I also come away acknowledging myself for being a great person. You have an uncanny knack, a bang on the money way of piercing through to what matters for people, of getting them to give up their deadening positions, of putting them in touch with their own real strength, power, and authentic Self. "More people trust you being more intimate with them than anyone else in history. Why do so many people open to you so deeply, so fully, so freely?" 3) It's clear to me and to people of good will everywhere, when we look at the state the world is in today, we're not even close to living what's possible for us human beings on our planet. Not ... even ... close! I notice almost all governments ie the people who have the power to shift the way the world works, are hamstrung by partisan bickering (I say "almost all" to be fair to the ones I don't know about). Yet paradoxically, partisan bickering is one of the privileges of democracy, our most cherished form of government. There's nothing wrong with it. It's simply untransformed. "You're currently bringing transformation to business and academia. What's the possibility of you bringing transformation to government?" 4) You've often stated transformation is speaking transformation. Furthermore, you've asserted I'm only transformed as long as I'm speaking transformation. A corollary of your assertion is when I'm no longer speaking transformation, I'm no longer transformed. You don't refer to it with the more familiar "speaking about transformation. You say, simply, "speaking transformation". "How is speaking about transformation different than speaking transformation?" 5) I'm always thinking. I'm never not thinking. The radio is always on in my mind. Sometimes it's playing more than one program at a time. Sometimes there's a television set or two in there as well, each tuned to a different channel. It's an anomaly for to me to consider what learning to think for myself might be when I seem to be already thinking all the time, automatically. "How is thinking different than thinking for myself?" 6) A great many of us, myself included ie especially myself included, miss being around you. That's the truth. It's a paradox. One of the greatest gifts of being around you is the gift of being whole and complete. Yet when I'm not around you, I miss you. Missing you seems to fly in the face of being whole and complete exactly the way I am and exactly the way I'm not. It's as if missing you is tantamount to admitting I don't get it. "Is missing being around you a disservice to you?" "Have you considered touring the United States being with us graduates and our guests again?" 8) If it were simply a matter of weighing up what we like and what we don't like, of what we prefer and what we don't prefer, it seems to me we would always choose to always be wide open, unstoppable, and fully Self expressed. Clearly that's not the case. In fact, it's the exception rather than the rule. "What stops us playing full tilt, flat out, full on all the time?" 9) Please say something about what your current irons in the fire are, something about all the balls in the air you're currently juggling. You're on the cutting edge of transformation. No, that's not quite right - you are the cutting edge of transformation. What you're experimenting with today becomes the next iteration of the work of transformation tomorrow. "What projects are you currently working on?" 10) By now you may have new insights which allow you to fine tune or even rephrase what your legacy will be. It's critical in an inquiry like this to keep one's attention on being in the inquiry and on asking questions. It's our thrown-ness to, it's our craving for answers which keep popping us up to the surface ie up to the superficial - like bobbing corks, looking for answers. In so doing, we pop up out of the only realm worth living in: the realm of asking questions, the realm of inquiry. In a sea of bobbing corks, you're the anchor. In a world of cave paintings, you're the rock.